FIX: You do not have permission to schedule Skype meetings on behalf of the owner. Skype for Business delegates the basics. We have many customers who use Outlook and Skype for Business. The secretaries make appointments for the CEO’s or other users . One problem is, is that S4b delegates are not very stable. My colleague Lennard and I have often been in contact with Microsoft engineers over this. From all these ‘Skype meetings’ with Microsoft, we’ve come up with a nice list with what the Skype permissions can break, but also what is needed before the delegate is added to Skype. I wrote the tutorial in 3 parts. What can break Skype permissions for delegates in Outlook? How do you assign Skype delegates in Outlook correctly? How do I fix broken permissions for skype meetings in Outlook? If you use Outlook 2016, directly scroll down to step 2, because it lacks a function that is needed for Skype for business delegations. Both users need to be logged on Skype for business at the same time. Both the delegater and delegate need to run the same Skype client version. Click small arrow next to settings > help > about skype for business to see the S4B version. Always use the full client. If someone logs on the basic client for one or two seconds the delegates can break.The outlook profile for the delegater needs to be the default profile. It doesn’t always work with Outlook cache mode on. Turning it off sometimes work. Skype needs to have MAPI and EWS available to access outlook. You can check this by ctrl + right click the Skype icon and search for MAPI. If that isn’t available your delegates will be removed. Only one session per delegater should be active on either Outlook, Skype or both. Opening another mailbox in OWA (delegator mailbox) can also break the settings. Opening another mailbox in Outlook (delegator mailbox) can also break the settings. This does not count for full access rights with automapping. If the MAPI or EWS says unavailable it’s probably because you’re using skype/outlook 2016. The link between Skype and Outlook 2016 does not work Properly. See the tutorial to fix this issue. A delegate can have up to 2 delegators when using Skype for Business MSI version. How do you assign S4B delegates in Outlook correctly? Bas Wijdenes will be de delegater and Kim Holland will be the delegate. Are there any permissions already set for the delegater? This could cause issues. If it isn’t too much of a hassle, remove these from the permissions list in Exchange Online. Start Outlook and make bas.wijdenes@contoso.com the default profile in Outlook. This is important, otherwise your skype delegates wont work. Start Outlook and Skype. Make sure both EWS and MAPI are Status OK in Skype. (shift + Right click skype icon > configuration information > Scroll down to EWS and MAPI). You do not have permission to schedule Skype meetings on behalf of the owner. Add Kim.Holland@contoso.com as a delegate in Bas.wijdenes@contoso.com’s Outlook. Wait 2 minutes then sign out from Skype, completely remove your credentials, wait 2 minutes again, then log back in to Skype and…. wait 2 minutes again. The delegate, Kim Holland should also see a group in Skype after re-starting Skype. There are a few settings which you must meet before it works. The outlook profile(delegater) needs to be the default profile. You can only add users as a delegate in outlook. They also need to be logged on to skype at the same time. Groups don’t work for skype delegates since they don’t have a SIP. Make sure that Skype for Business is the full client in the Microsoft Office pack! If you’re using Outlook 2016 follow the instructions below. It can take up to 24h before it starts working, yet most of the time this is between 2-5 minutes. To fix this problem automatically, click the Download button. In the File Download dialog box, click Run or Open, and then follow the steps in the easy fix wizard. You must perform these steps on the delegater’s PC. This wizard may be in English only. However, the automatic fix also works for other language versions of Windows. If you’re not on the computer that has the problem, save the easy fix solution to a flash drive or a CD, and then run it on the computer that has the problem. To run the easy fix, you will need to enter the Legacy Exchange DN of your Exchange account. 2. select Test E-mail AutoConfiguration. The Test Email AutoConfiguration box will pop up. Make sure to copy everything between the <LegacyDN> tags. /o=ExchangeLabs/ou=Exchange Administrative Group (FYDIBOHF23SPDLT)/cn=Recipients/cn=77fdf4feb9e247059b8a6724eb2588da-Bas Wijdene. Now restart Outlook and Skype for business and wait 3-5 minutes to see the delegates in Skype. You can also do the easy fix manually, see below. This is from the Microsoft website. Start Registry Editor. Type regedit.exe at the Start screen, and then click regedit in the search results. If you are prompted for an administrator password or for confirmation, type the password, or click Allow. Under this key, locate the name of your Outlook profile, and expand it (by default the profile name is “Outlook,” but it can be whatever you named your profile if you created it manually). Under the profile, locate the 9375CFF0413111d3B88A00104B2A6676 key, and then expand it. Under 9375CFF0413111d3B88A00104B2A6676 key, you’ll have a subkey for each account in your profile. Select the first subfolder (00000001), and then examine the data of the Account Name binary value by double-clicking the value. Repeat this process until you find the Account Name value that includes your SMTP address. Under the \0000000x subkey that includes your SMTP address, locate the Service UID binary value. It represents a GUID (for example c3 d1 9a 7b 80 1b c4 4a 96 0a e5 b6 3b f9 7c 7e). Locate the subfolder in your profile that matches the GUID value identified in step 6 (for example, \c3d19a7b801bc44a960ae5b63bf97c7e). Under the subkey found in step 7, examine the 01023d0d binary value. It represents a GUID (for example, 5f cf d5 f1 ba 5c 6f 45 b3 57 cc 5e 0d 16 94 58). Locate the subfolder in your profile that matches the GUID value identified in step 8 (for example, \5fcfd5f1ba5c6f45b357cc5e0d169458). Find the user’s Legacy Exchange DN. 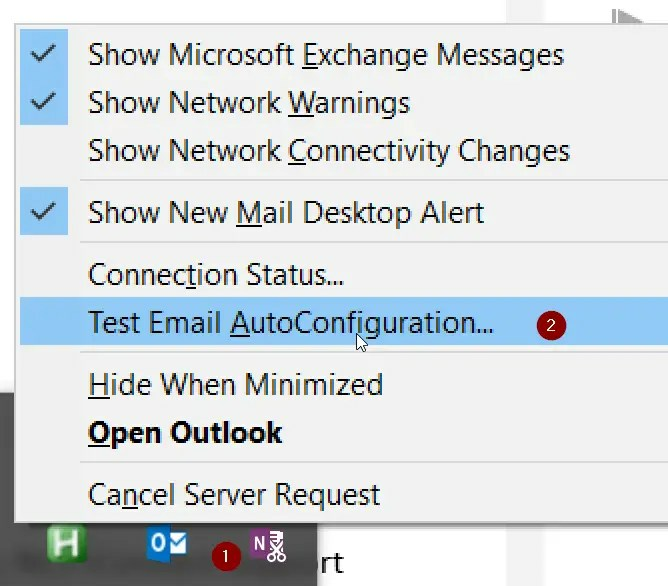 Hold down the Ctrl key and right-click the Outlook system tray icon, and then select Test E-mail AutoConfiguration. After the box appears, clear both the Use GuessSmart and Secure Guessmart Authentication check boxes, and then click Test. After the test is complete click the XML tab, and then locate the LegacyDN value. To get the LegacyDN look at the first part of the tutorial. Now, completely log off Skype and make sure that it’s not running. Then, log back in to Skype, and wait a minute or two. Check the Skype configuration. It should now show MAPI Status OK.
Are you still seeing: “You do not have permission to schedule Skype meetings on behalf of the owner”? It’s also possible that a corrupt permission is causing this problem. I’ve wrote another blog post to remove corrupt permissions, click here to see the blog post. Do you have feedback or is something now clear? Please leave a comment as well. Spent good 2 hours playing with this and failing to make it work, after forcing :/calendar delegation through powershell it started to work on OWA but would just refuse to accept delegate sync over to s4b. Hi Bas, great job there, but the download is not working with outlook 2016, it says its only for 2007 and 2010 outlook versions. I have access to many executives calendars in my office. I randomly lost access to setup Skype meetings for several executives…some of them, but not all of them, with no rhyme or reason. We were told that the more calendars an administrative assistant has delegate access to, the more likely that access could be lost….and that the system is really only setup for a delegate to have access to no more than 2 calendars. Wondering if you have any familiarity with this issue? I believe the maximum to work is 25. We use Outlook 2016 across the college. Are you saying you can’t use Skype delegation at all with Outlook 2016? the fix (with download) you provided, do we perform this on the delegate pc or the delegater?